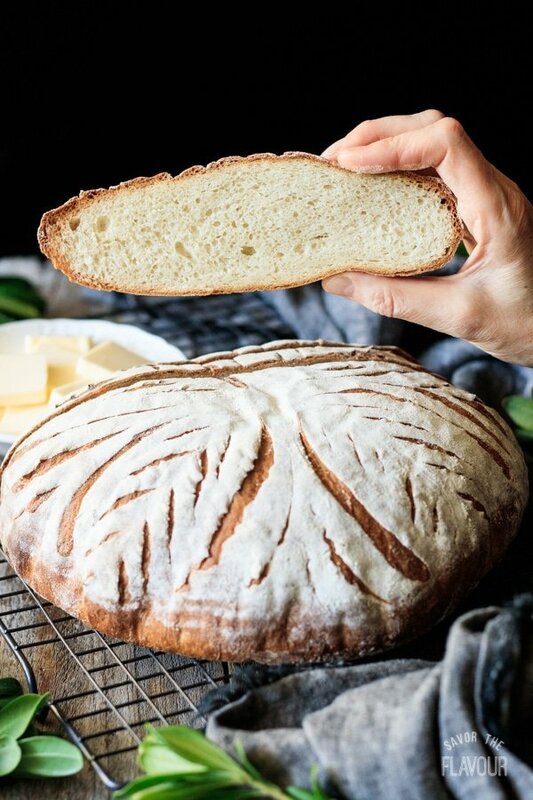 This simple and delicious recipe for white mountain bread is perfect for beginners. Use your Kitchenaid to mix up one loaf of fragrant yeast bread that’s so good your family will think it’s from an artisan bakery! It only takes flour, salt, yeast, butter, honey, and water to make this delectable sandwich bread. This post was originally posted on December 27, 2017. Have you ever tried to make bread on your own, and it didn’t turn out so great? It’s happened to me before, too! Don’t be discouraged; it takes practice to do any kind of baking well, especially bread. What ingredients are in white mountain bread? Most breads are made from four basic ingredients: flour, salt, yeast, and water. For this white mountain bread, I’ve added honey and butter to soften the texture and add a little extra flavor. 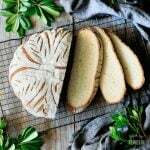 How long does homemade bread last? Homemade bread will keep for about 2 days at room temperature. Make sure it’s sealed inside of a zip-top plastic bag or tightly wrapped in aluminum foil to keep it moist. Don’t store bread in the fridge; it will make it go stale very quickly. Need to keep the bread for longer than 2 days? Wrap it in plastic wrap, then aluminum foil and freeze for up to 6 months. Thaw in a low oven, toaster, microwave, or on the counter. How do you make white mountain bread? Gather the ingredients: flour, salt, yeast, water, butter, and honey. Add the butter and honey, then mix with the paddle attachment on low speed until combined. Punch the dough down all over to knock out the pockets of gas, forming it into a rough circle as you do so. Fold the edges of the circle into the center to form a tight ball. Pinch the ends together, turn the loaf seam side down, and let it rest for 5 minutes. Turn the loaf over, flatten it slightly, and fold the edges into the center again, making sure it’s quite tight. 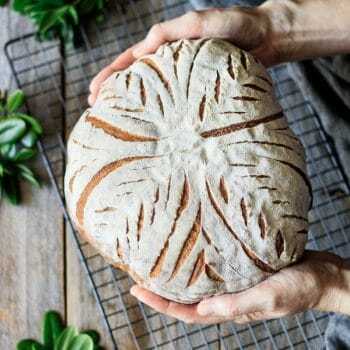 Turn the loaf right side up and turn it, cupping your hands around the loaf as you turn to even the shape. Place the loaf seam side up in a floured banneton (if you don’t own one, use a greased and generously floured bowl). Let rise at room temperature until almost doubled in size, about 45 minutes. The dough should slowly spring back when pressed with a fingertip. About 20 minutes before the loaf is done rising, preheat the oven to 450 F and slide a large pizza stone onto the middle shelf of the oven (use two baking sheets stacked on top of each other if you don’t own a pizza stone). Sprinkle some semolina flour or grits on a cake lifter or pizza peel. Turn out the loaf onto the prepared peel and gently massage some extra flour into the top of the loaf. Don’t worry if the loaf deflates a little; it will rise back in the oven. Slash with a lame (use a very sharp serrated knife if you don’t have a lame) and carefully slide the loaf onto the preheated baking stone. Bake at 450 F for 10 minutes, then lower the temperature to 425 F without opening the oven door and bake for another 20 minutes. The loaf should be richly browned and have an internal temperature of 200 F on a meat thermometer. Let it cool completely on a wire rack before slicing and serving. Use high-quality ingredients, especially for the flour. Since there’s only six ingredients in this recipe, it’s important each one tastes great. Don’t substitute all-purpose for the bread flour. Bread flour contains more gluten than all-purpose, giving the loaf a higher rise and more chewy texture. Don’t have a stand mixer? 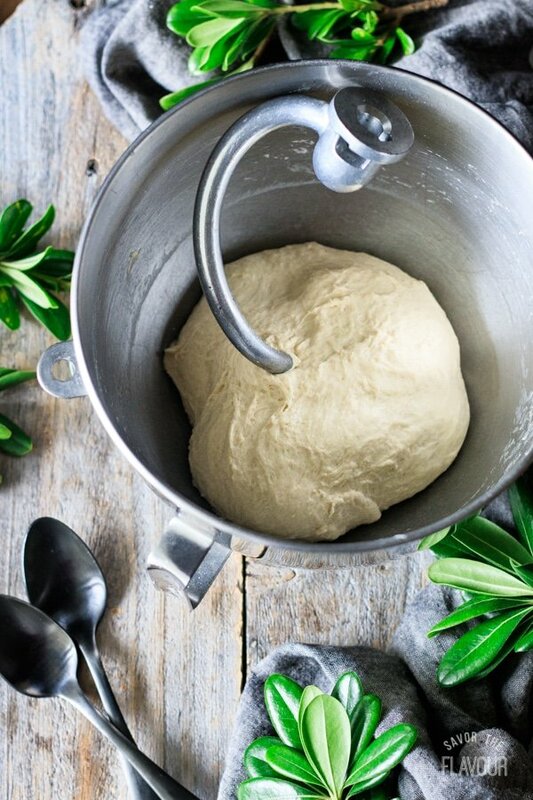 You can make this bread by hand–just mix and crush the dough with your hand instead of the paddle attachment, and knead on a lightly floured surface. Mix up the dough, then let it rest for 10 minutes before kneading. It will improve the texture of the dough and help it not to be as sticky. Don’t skimp on the rising time; it’s crucial for developing a well-flavored, beautifully textured loaf. 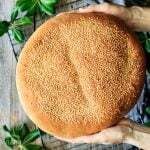 Once you’ve shaped the loaf, let it rise in a banneton (a cane basket made specifically for bread) or a greased and generously floured bowl. This will keep the loaf from flattening as it rises. Don’t want to have a round loaf? 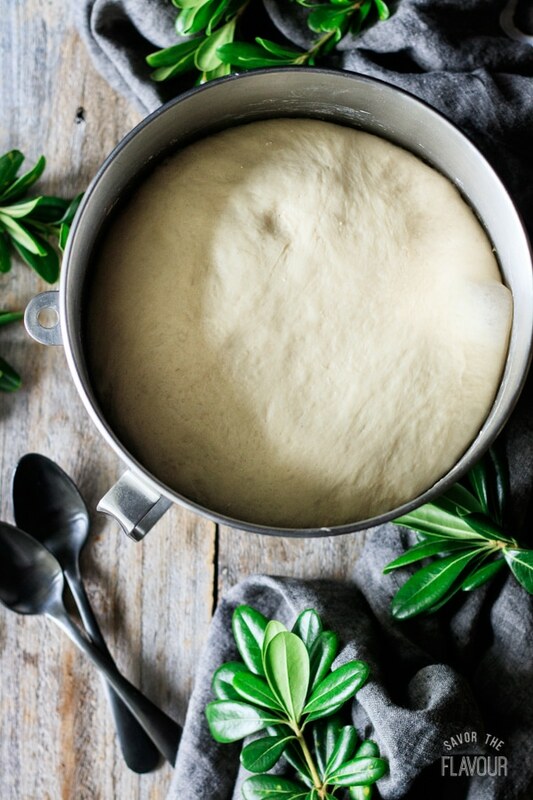 After the dough’s first rise, punch it down and pat into a rectangle the width of a loaf pan. Roll it up tightly, pinching the seam to seal and place inside a loaf pan. Proceed with the recipe as written–omitting the part about the baking stone. Bake the loaf in a hot oven for a crisp, well-browned crust, good oven spring (rising in the oven), and moist interior. Let the white mountain bread cool completely on a wire rack before slicing and serving. Freshly baked bread is full of steam, and needs time for the inside to finish setting. If you cut it too soon, the bread will be gummy. 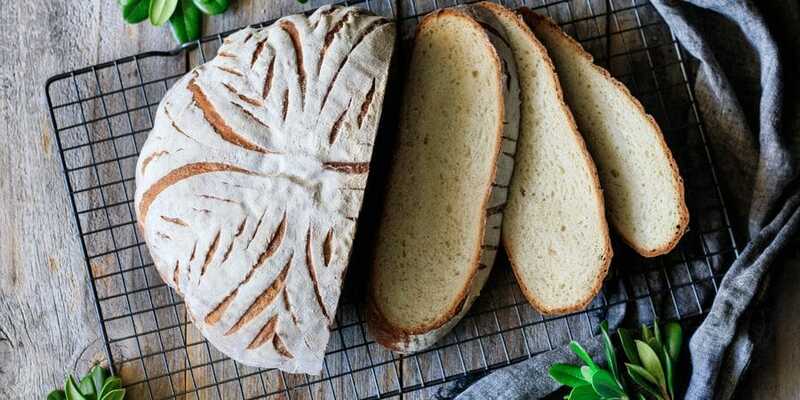 Love homemade bread? You’ll want to try these other delicious, easy bread recipes. 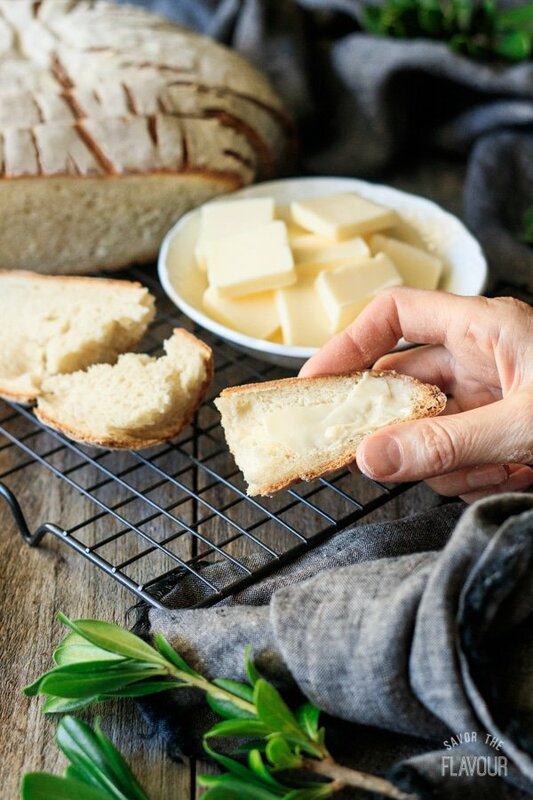 Super Easy Homemade Italian Bread: this simple loaf has a classic crunchy crust and soft interior. Overnight Potato Bread: this make ahead friendly loaf is so soft and fluffy, you’ll want a second piece! Perfect Muffaletta Bread: this light, soft bread is topped with sesame seeds and makes a fantastic muffaletta sandwich. Did you make this white mountain bread? Please leave a star rating below the recipe to share how you enjoyed it. 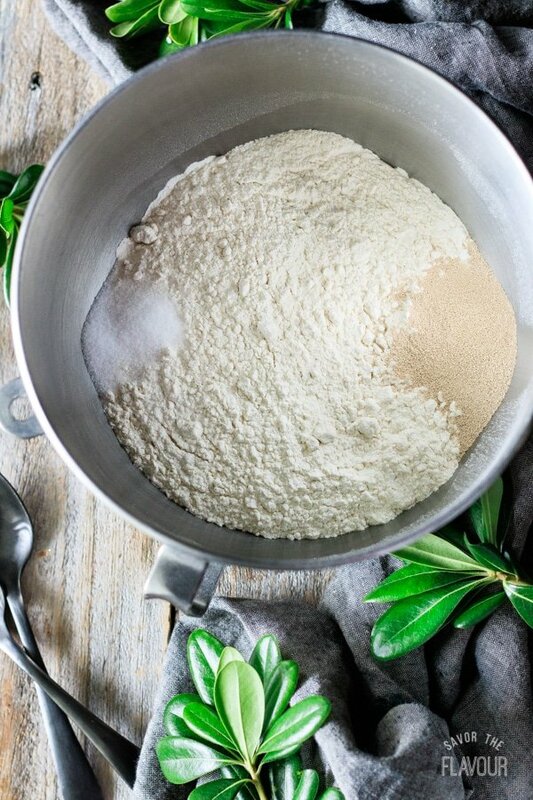 Place the flour in the bowl of a stand mixer and add the salt and yeast on opposite sides of the bowl. Stir in each with your finger. Add the butter and honey and mix on low speed with the paddle attachment until blended. Pour in half of the water and mix on low speed to form a rough dough. Gradually add more water and mix until all the flour has been picked up from the bowl and a somewhat sticky dough has formed. 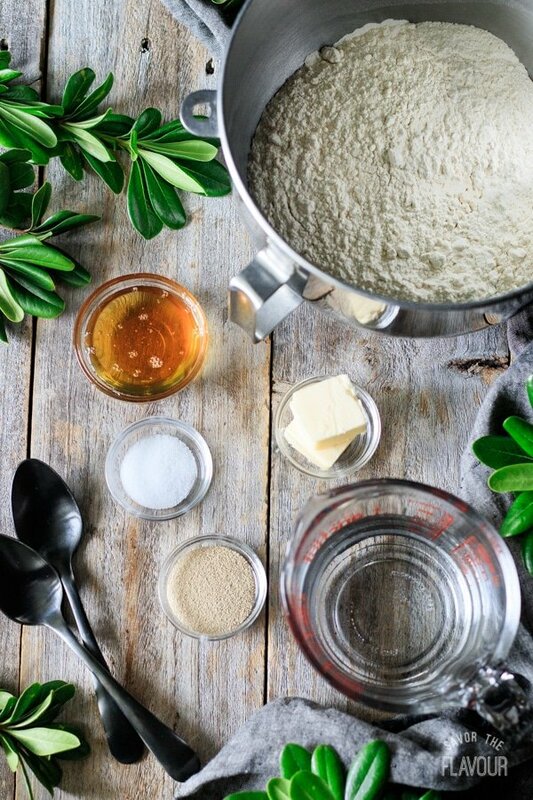 Depending on the brand of flour you’re using and the humidity in the room, you may not need all the water, or you might need a little extra. 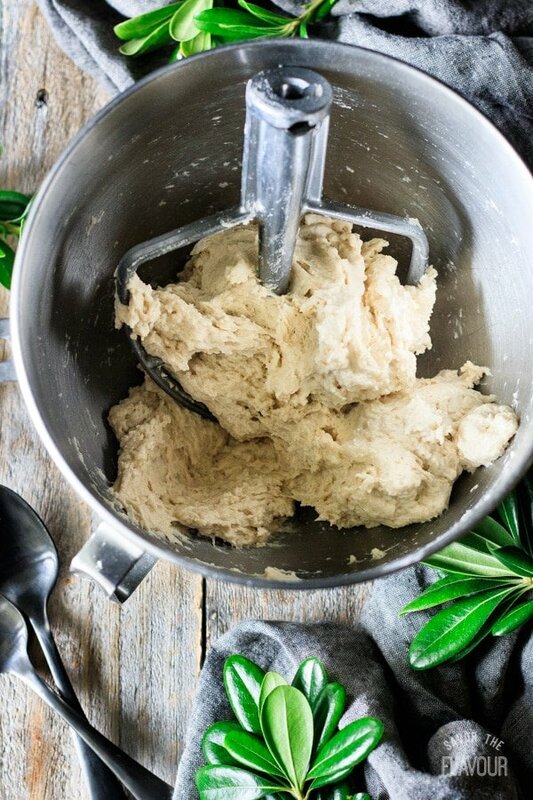 Turn off the mixer and let the dough rest uncovered for 10 minutes. This will help the dough be less sticky when it’s kneaded. 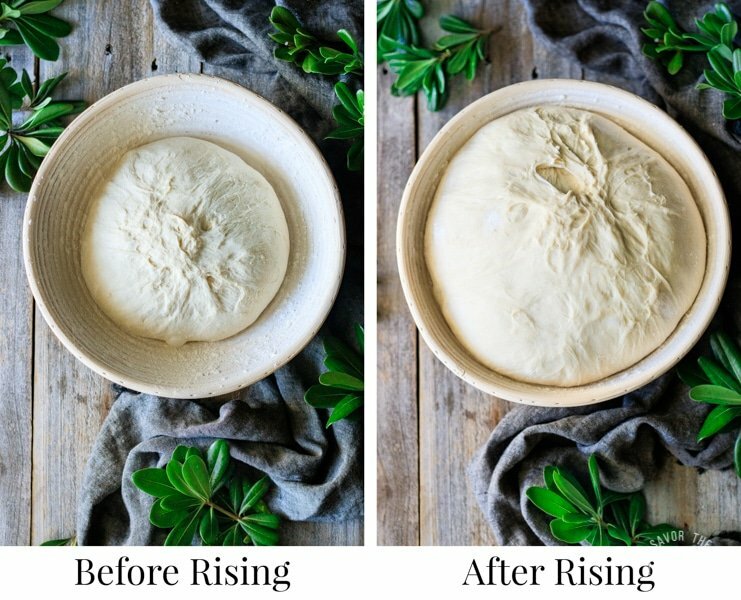 Switch attachments to the dough hook and knead for 5-8 minutes on medium-low speed until the dough is smooth and cleans the sides of the bowl. 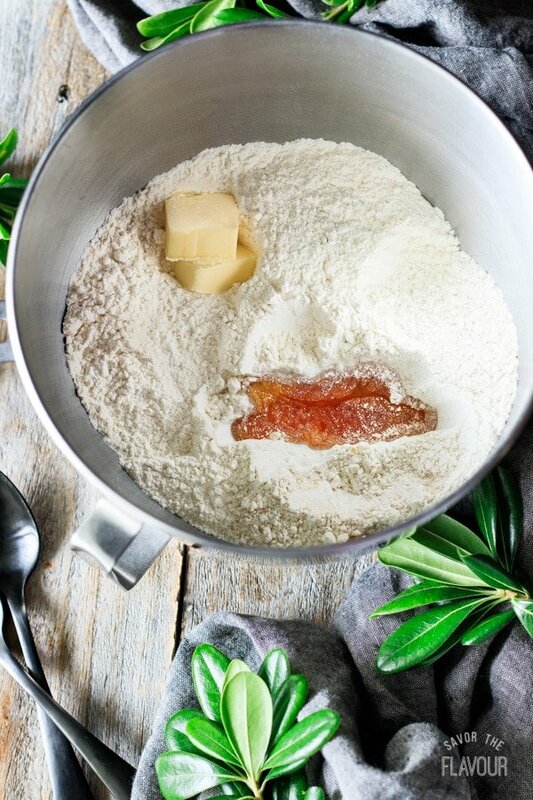 If it’s too sticky and doesn’t clean the sides of the bowl, add extra bread flour just a spoonful at a time until the dough cleans the bowl. The dough should also pass the windowpane test. Stretch a piece of dough between your hands to form a windowpane. The dough should be translucent without breaking; if not, knead for a minute longer and check again. Shape the dough into a ball, put it back in the mixing bowl, and cover tightly with plastic wrap. Let the dough prove until at least doubled in size, about 1 to 1 1/2 hours. Alternatively, place it in the fridge to rise overnight (8-12 hours), and continue with the recipe as written the next day. Turn out the dough onto a clean, lightly floured work surface and punch it down all over to force out the pockets of gas in the dough. Shape the dough into a rough circle, then fold the edges into the center and pinch them together tightly to seal. Turn the loaf over so the seam is underneath, and let it rest for 5 minutes. Turn the loaf over, flatten slightly, and fold the edges into the middle as you did before, pinching the seam to seal. Turn the loaf seam-side down, cup your hands around the loaf, and turn it in a circle to shape it into a taut, circular loaf. 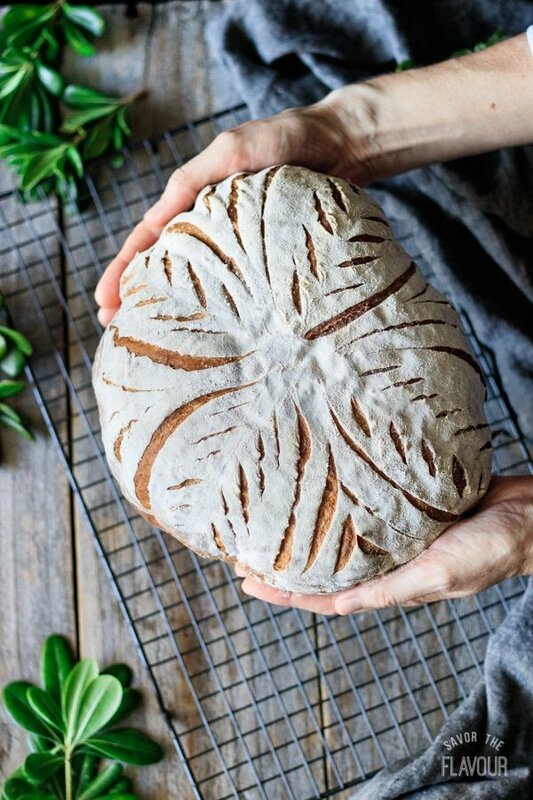 Place the loaf seam side up inside a floured banneton (a cane basket specifically made for proving bread) and cover with a linen cloth or tea towel. Use a greased and generously floured bowl if you don’t own a banneton. Let the dough rise for 45 minutes to 1 hour, depending upon the temperature of the room. The dough is ready to be baked when it springs back when gently pressed with a fingertip. About 20 minutes before the dough is fully proved, preheat the oven to 450 F and put a large pizza stone in the oven to preheat. If you don’t own a pizza stone, use two baking sheets stacked on top of each other instead. Immediately slide the loaf onto the hot pizza stone. Bake the loaf for 10 minutes at 450 F, then lower the temperature to 425 F without opening the oven door and bake for another 20 minutes. The loaf should be a rich brown and have an internal temperature of 200 F.
Let the loaf cool completely on a wire rack before slicing and serving, approximately 1 hour. The loaf’s proving time will heavily depend upon the temperature of the dough’s surroundings. Cool temperatures will slow down the yeast, while warm temperatures speed up the yeast. Be careful not to put the dough in a hot place, as it will cause the yeast to work too quickly and may kill it. 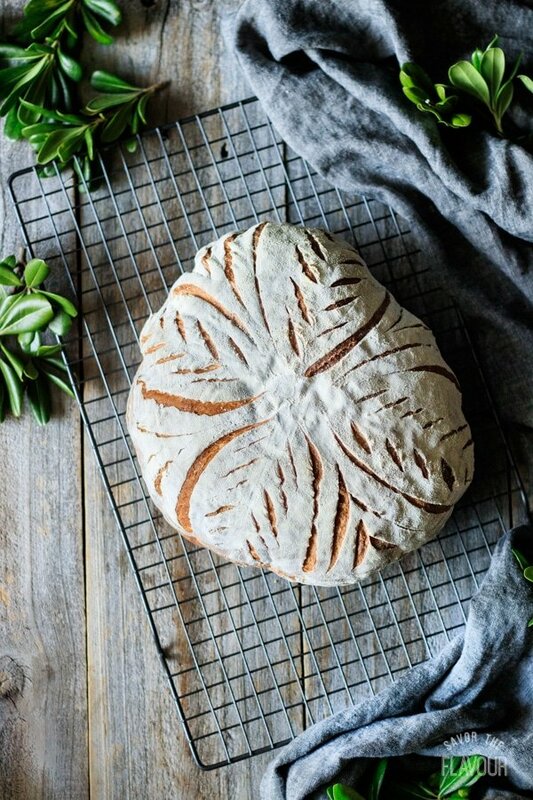 Make this recipe even easier by making this bread in a loaf pan. Just shape the dough in a rectangle as wide as the long side of your loaf pan. Roll it up tightly, pinch the seam to seal, and place it seam side down in the pan. Proceed with the recipe as written. I’m so glad that you enjoyed it and that it turned out good. 🙂 Dissolving the yeast in the water is needed only if you’re using active dry yeast. I always use fast-action (aka instant) yeast in my recipes to omit this step. 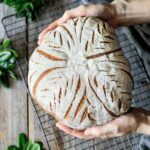 How did you make the design on the loaf? I’m new to baking breads and my father loves white mountain bread. He actually sent this recipe to me. I’m sure he was wanting me to bake it for him and just didn’t say anything lol.! So anyway does it automatically turn white like that as well? It’s very beautiful and looks amazing. I hope mine will turn out like the one in the picture if not I will keep trying. I used a special knife called a lame to cut the designs. If you’re really into bread baking, I’d highly recommend getting a lame, because using a regular kitchen knife to score the bread is much more tricky. The particular design I used was inspired by Anna Gabur from Bread Journey on Instagram; although I’d recommend a simpler slashes for beginners. Can this be made in a bread machine ? I’ve never made this bread recipe in a bread machine, so I’m not sure how it would turn out. 🙂 Feel free to experiment and let me know how it works for you!